Floortime activities for autistic kids were pioneered by Dr. Stanley Greenspan as an alternative approach to the rigid structure of applied behavioral analysis (ABA). The Interdisciplinary Council on Developmental and Learning Disorders further expanded on the treatment model with its DIR/Floortime approach, which includes other therapies, such as speech and occupational therapy. Floortime is a child-centered approach in which parents, teachers and therapists engage in play that interests the child. It is supposed to help autistic children learn to focus and interact with others around them to increase attention and improve social skills. Floortime and DIR/Floortime activities can help build connections in a child's brain that foster social, emotional and intellectual skills. The child-centered nature of the therapy builds strong social connections with parents, therapists and other people involved with the child. Parents have an essential role in their child's therapy in this model, unlike ABA or other therapies that are practiced by professionals. Floortime's fluid approach to autism therapy tailors to the individual needs of each child as it follows the child's lead. Through the Tunnel - Show your child how to drive a toy car around on the floor by first demonstrating the action for him. Make a tunnel out of your arms and encourage him to drive the toy car underneath and through the tunnel. Praise him for any effort he makes. Read a book - Sit down with your child and have him choose a book he wants to read. Use interactive books with flaps or touch items to further enhance the experience and encourage him to turn the pages. Ball Play - Allow your child to choose from a variety of different sized balls. Help her to roll the ball on the floor, toss the ball in the basket or play catch with you. Color Sorting - Purchase colored buckets or place a piece of colored tape on baskets and help your child to sort same colored toys and crayons into the corresponding colored basket or bucket. 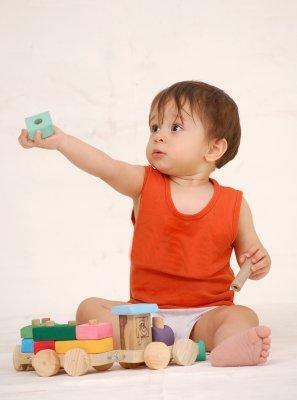 Building Blocks - Take turns building a tower as high as you can with plastic blocks or Legos. This encourages turn taking, and it can help your child learn colors and matching. Dance With Me - Turn on you or your child's favorite songs and dance around the living room. Imitate your child's movements and encourage her to imitate yours. Texture Steps - Cut out squares of different textured materials (cloth, aluminum foil, bubble wrap and wax paper) and create a path for your child to walk along. This sensory activity exposes the child to different textures while using gross motor skills. Puzzles - Allow your child to choose a favorite puzzle and take turns placing the pieces in the appropriate spots. Remember, the point of Floortime activities is to let the child lead the play and you join in. Parents encourage their child to explore different aspects of play and learn about taking turns and social reciprocity. DIR/Floortime activities gently nudge children to make deeper social connections through shared engagement. The adults enter the child's world to engage him rather than taking control of the session. You can opt to follow Greenspan's model, or you can choose floor time activities that can help your child meet other goals. Engaging activities can keep a child on task, but you can move academic and behavioral therapies to the floor, too. Try tasks that your child has already mastered in discrete trial and applied behavior analysis (ABA). This reinforces mastered skills while moving them to a new setting. Communication is more than using words to express thoughts and feelings. Social communication requires give-and-take exchanges that may require practice. Board games are excellent floor time activities that build a foundation. Taking turns, for example, is a fundamental aspect of effective communication. Use PECS or pictures showing various expressions and ask, "How is she feeling? Show me a happy face." Many floor activities can help a child on the spectrum to improve dexterity and coordination, but fine and gross motor activities can address other skills too. For example, you can create a program that works on following directions, object labeling and countless other skills. Fine motor activities build important skills necessary for daily living. Gross motor and fine motor activities can used for sensory integration as well. Remember to teach your child is that fun is part of the approach. Don't be afraid to be silly and entertaining to keep your child engaged. Keeping the lessons light will encourage learning, so avoid pressuring your child toward the desired goals. Stealth learning, disguised within active play, is the key to successful sessions.